History, and the Hall of Fame, will regard Emmitt Smith kindly. He was, simply, one of the finest running backs to ever touch the pigskin. 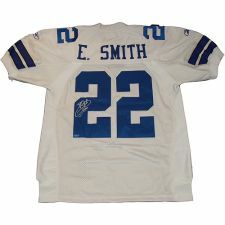 Upon his retirement from the Dallas Cowboys in February, 2005, Smith was the all-time leading rusher, with 18,355 yards, and he boasted 78 games in which he rushed for 100 yards or more, also an NFL record. Among the highlights of Smith's career was the Cowboys-Seahawks game on Oct. 27, 2002, when Smith broke Walter Payton's all-time rushing record. Emmitt Smith has hand signed this white Reebok Cowboys jersey.